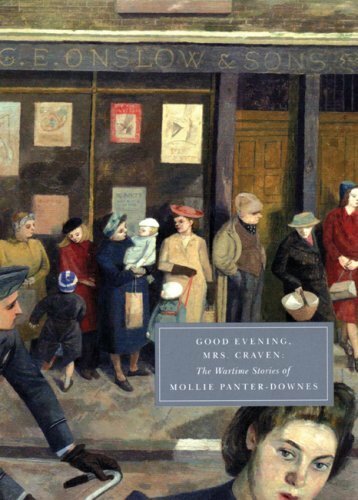 Good Evening, Mrs Craven, by Mollie Panter-Downes, has to be one of my ‘best reads’ of 2011. Here are 21 short stories set in the Second World War, about the people who didn’t fight, the non-combatants, who kept the home fires burning and, despite the war – or, perhaps, because of it – tried to maintain a degree of normality. Panter-Downes wrote about the world she knew: middle class women and the impact of the war on their lives. Such men as there are seem to be guilty and slightly defensive about their presence in this predominantly female world, and their intrusion is somehow shockingly alien. They are anxious to preserve male superiority, and imply their work, whether in the forces or as a civilian, is of overriding importance and cannot be understood by wives, girlfriends, lovers, but they never reveal exactly what it is that they do. However, we know it is the women and their ‘work’ getting to grips with the problems of everyday life which is of real importance. They cope with missing men, food shortages, lack of domestic help and the disruption caused by evacuees and long-stay guests, still keeping up appearances, and observing the social niceties of life, however insignificant they may seem. These are gentle, bittersweet stories, where not a lot happens. There is no real action, and no overwhelming emotion or feeling. People deal with the situations and conditions they find themselves in, no matter how different to their previous experience this may be. But they remain reserved, never revealing their true feelings to others, never opening up, never connecting, so there are missed opportunities and lives which could be charged, but never are. There is the eponymous Mrs Craven, cool, calm and collected, who has provided solace for her married lover for many years, but is not to know of his fate during the war, and Ruth, who faces her husband’s departure for battle with courage and fortitude, but cries when a mix-up delays him and she must go through the leave-taking again, and Mrs Ramsay, yearning for the quiet, well-ordered life she led before visitors fleeing London took over her home. Panter-Downes is a detached observer, with a humorous, slightly ironic tone. She sees what is happening, and records it, but doesn’t judge or interpret: it’s for the reader to do that. As an author, she felt she couldn’t invent and saw herself first and foremost as a journalist – she lived and worked in England, but wrote for The New Yorker, which published these stories between 1939 and 1944. By the way, the cover of the Persephone edition I borrowed from the library deserves a mention, because it is every bit as good as those early Virago covers, where carefully chosen paintings enhanced the books. This picture shows part of The Queue at the Fish Shop, by Evelyn Dunbar (courtesy of The Imperial War Mueum) and perfectly matches the text. Dunbar painted women and their role during WW2, and was the only female artist paid by the War Artists Advisory Committee.